Research papers on The Pit and the Pendulum point out Edgar Allan Poe immediately grabs the reader’s attention by announcing that he is sentenced to death. Paper Masters custom writes literature research paper on any short story from Edgar Allen Poe. For example, The Pit and the Pendulum by Poe can be explicated through a research paper that looks at the theme, symbolism or plot of the short story. You tell us what you need and our writers produce it for you. Research papers on The Pit and the Pendulum point out Edgar Allan Poe immediately grabs the reader’s attention by announcing that he is sentenced to death. He wastes no time in setting the tone for which he is so famous--one of Gothic horror, the macabre, and gloom and doom. Poe gives the readers no choice but to vicariously experience the narrator’s horrifying situation in the The Pit and the Pendulum by writing in the first person. Readers sense a happy ending, though, by observing Poe's use of past tense. He uses the verb construction “I saw” fifteen times, for example, and the construction “I felt” nine times, so there is no room for analysis or intellectualizing in The Pit and the Pendulum. The narrator’s horror is materializing quickly, and the reader also “sees” and “feels” the same sense of growing terror as the narrator is experiencing. 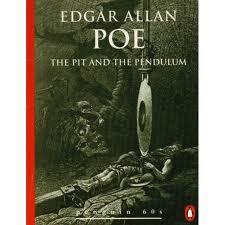 Research papers demonstrate Poe’s literary deftness at work in The Pit and the Pendulum. Toward the end of The Pit and the Pendulum, as the plot reaches its climax, Poe’s use of verbs become more varied and colorful in order to mimic the narrator’s growing sense of terror and fear of death. He moves from the repetitious “I saw”s and “I felt”s to more descriptive, stronger verbs that he uses only once or twice. “I thrust my arms wildly above and around me in all directions,” he writes, for example, as the narrator tries to make sense of his surroundings. A few lines down, “I at once started to my feet, trembling convulsively in every fibre,” and then he tells us that “Perspiration burst from every pore.” He moves from the general to the specific. Edgar Allan Poe’s usage of symbolism within his stories and poems creates more depth for the reader. This essay has shown how in three different stories - “The Cask of Amontillado”, “The Imp of the Perverse” and “The Pit and the Pendulum” - this imagery is both distinct and successful. It is distinct by Poe’s usage of symbolism with references to history and Biblical verses, with language and tone, and with imagery, and it is successful because it adds to the reader’s understanding of the text. Poe signified much when he wrote and this symbolism is one of the key ingredients that makes his one of the most revered bodies of work in literary history. Life of Edgar Allen Poe - Life of Edgar Allen Poe Research Papers discuss an order placed for an autobiography of the writer along with opinions about his writings and what made him select his themes. The Tell-Tale Heart - Edgar Allan Poe's short story, The Tell-Tale Heart begins and ends with a tone of horror. Edgar Allan Poe and Detective Fiction - In a Poe and detective fiction research paper, outline Poe’s contribution to the genre by presenting textual evidence, comparisons, and explanations of Poe’s unique detective-fiction formula. The Purloined Letter - The Purloined Letter research papers examine Edgar Allen Poe's detective fiction. The Narrative of Arthur Gordon Pym - Edgar Allan Poe's The Narrative of Arthur Gordon Pym appears on the surface to be the retelling of one man's adventure at sea. The Fall of the House of Usher - Research papers point out that the house in The Fall of the House of Usher sets forth an evil force, one that eventually traps the narrator. The Raven - The Raven research papers discuss Edgar Allen Poe's use of suspense in his poems including the Raven. Romantic Era and Fall of the House of Usher - The Fall of the House of Usher illustrates how Edgar Allen Poe's novel is symbolic of the Romantic Era in Literature. Ligeia - Ligeia Research Papers look at a story by Edgar Allan Poe about a type of immortality achieved by someone who is obsessive and appears to be a little mad. The Tell-Tale Heart and Madness - The Tell-Tale Heart and Madness is a common research paper topic for Edgar Allen Poe research. The Black Cat - The Black Cat written by Edgar Allen Poe, has been called “one of the most powerful of Poe’s stories” with a horrific element that just barely “stops short of the wavering line of disgust”. The Murder in the Rue Morgue - The Murders in the Rue Morgue is one of Edgar Allen Poe's detective fiction stories that you can order a custom research paper on. Romantic Era - Romantic Era Research Papers inspect the writings of different authors during this period. Roderick and Madeline Usher - Roderick and Madeline Usher research papers explain the main characters in Edgar Allen Poe's novel The Fall of the House of Usher. Poe's Fall of the House of Usher - Poe's Fall of the House of Usher Research Papers delve into a sample of an order placed for the analysis of one of Poe's famous stories. Southern Gothic Literature - Southern Gothic Literature Research papers and essays on gothic literature in the South. Endymion - Romantic Era and Fall of the House of Usher illustrates how Edgar Allen Poe's novel is symbolic for the fall of the Romantic Era in Literature. Short Stories - Many of the great American writers of the early 19th century wrote short stories, including Edgar Allan Poe, Nathanial Hawthorne, and Washington Irving. The Rights of Woman - Essay on the reading of Anna Letitia Barbauld's poem The Rights of Woman as printed in The Norton Anthology of English Literature, The Romantic Period, Eighth Edition, Volume D.
Paper Masters writes custom research papers on on The Pit and the Pendulum and point out Edgar Allan Poe immediately grabs the reader’s attention by announcing that he is sentenced to death.